What are the graduates saying about us? Please see the Heartwood Gathering for more up to date information and to register. The class meets every Thursdays 6:30 PM to 8:30 PM for 20 classes. Please note there are no classes schedule for August 15, 22, 29. Any missed classes may be made up the following year. 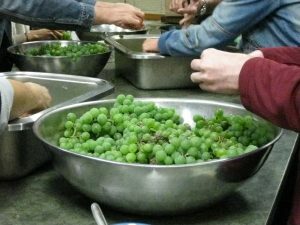 To guide participants through one entire growing season, in order to learn about and experience the planting, tending, and harvesting of approximately 25 medicinal plants which grow readily in Ontario. 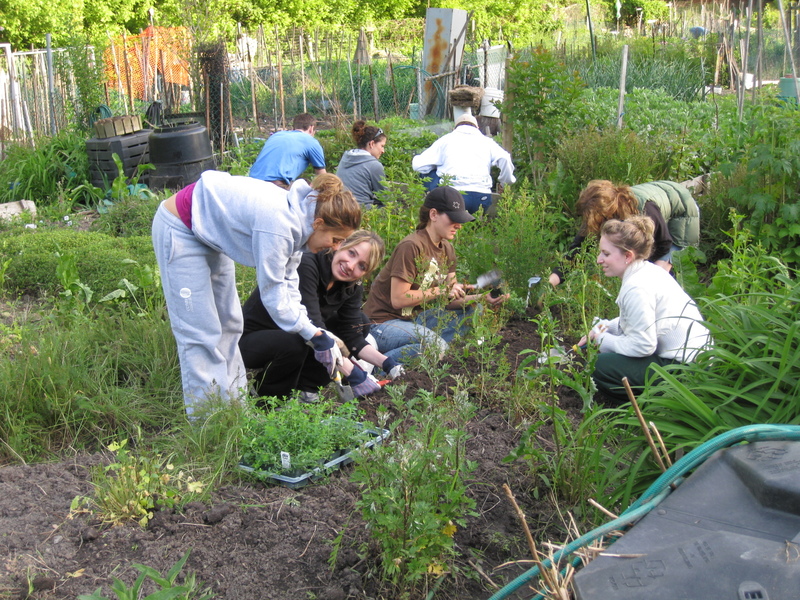 Students will participate in a group garden provided by the teacher and they may grow some plants at home in their own gardens. To discuss the medicinal uses of these plants & about 25 more local wild herbs. To learn by doing, how to prepare and use the various remedies they provide; to address concerns about the appropriateness of herbal medicine for our time and the importance of ecological sustainability. To learn how to use the herbs safely and appropriately for the improvement of personal health and the health of the ecosystem. The garden will be available for tending and harvesting on days not scheduled for class. 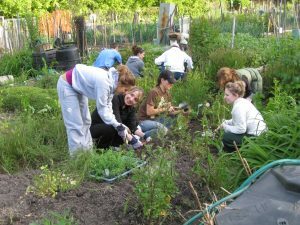 Elective group gardening time and herb walks will be scheduled in, according to student/teacher availability over the summer. Herb walks around Ontario will take place spring, summer, and fall. Enrollment will be limited to about 30 Students. The cost for the entire course will cover lectures, class notes (efiles), herb walks, gardening time, herb products and food products. Students will keep an assortment of tinctures, salves, syrups, creams and fermented foods that they have manufactured during class time. Continuing Education Credits may be applicable for professionals. A Certificate of Completion will be awarded at the end of classes upon request. A holistic model of health & treatments will be elucidated. We will cover all the body systems and approximately 100 herbs by actions, pharmacology, and energetics. Advanced concepts and principles of the natural sciences will be introduced and applied. Botany, pharmacognosy, phytochemistry, pharmacology, herb-drug interactions, and human physiology will be presented with the principles addressed and integrated into the course at the appropriate times. A holistic model of health & treatments will be elucidated. We will cover all the body systems and approximately 100 herbs by actions, pharmacology, and energetics. Basic concepts and principles of the natural sciences will be introduced and applied. Botany, pharmacognosy, phytochemistry, pharmacology, herb-drug interactions, and human physiology will be presented with the principles addressed and integrated into the course at the appropriate times. A holistic model of healing using the paradigms of deep ecology will be the basis of the paradigm in which herbal protocols will be formed. A systematic method of integrating Western Bio-Medical information in an inherently holistic context will allow the students to utilize the resources of what is called “Allopathic” medicine and “Holistic” or “Naturopathic” medicine. We understand the Vis. A herbal material medica will be developed and cross referenced by physiological action categories, body systems and tissues affinities, pharmacognostic plant metabolites, energetics, and historical uses. The basic structure of the classes will be to take each body system and summarize its place in the whole. Next, the patterns that lead to disease conditions and the physiological processes involved will be examined in detail including some specific pathologies. Case studies (from intake to diagnosis to prescription) will be discussed using the “method” and herbal selection criteria to generate holistic protocols including patient specific herbal formulations. Proper forms of herbal products i.e. tinctures, tisanes, decoctions, fomentations etc. will be addressed on a case by case basis. Products from health food stores, home medicine chests and professional dispensaries will be considered. Class notes and handouts will be provided electronically. Enrolment will be limited to about 30 Students. Distant students will be Zooming in for lectures. Or payment plans are available, email Susan to set that up. A Certificate of Completion will be awarded at the end of classes. CE credits (category A & B) from CONO are pending and will be granted to professionals who take the course. 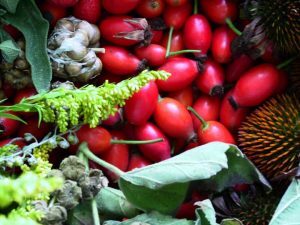 I completed the Medical Herbalism course approximately 10 years ago, and feel it is one of the most useful continuing education courses I have taken from a clinical skills perspective. A great course for translating the largely materia medica-based botanical medicine training at CCNM into effective formulae, and other practical botanical applications. Highly recommended for CCNM students and graduates who have not had additional herbal medicine training. 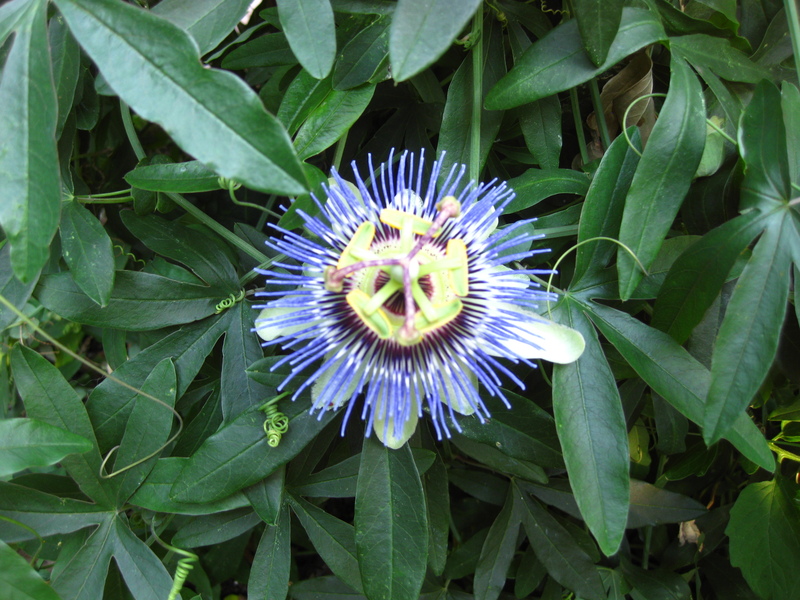 "If you depend upon the use of botanicals in your practice then consider this course mandatory. Finally, you will have a chance to learn from a great mentor that actually has practical skills and knowledge as opposed to the same old recycled info in most modern herbal texts. I have discarded most of the waste that I was taught in many seminars going through school because of lack of efficacy in a clinical setting, but the information I have received from John has shaped my practice." Dr. Seth Yates BSc(Kin), ND, RAc. I am so grateful to have taken John Redden’s course, Advanced Therapeutic Protocols. It was an invaluable part of my herbal studies. John embodies a profound understanding and respect for plants and imparts that knowledge and passion to his students. The course is filled with clinical applications and protocols of most conditions that one would see in their practice. In addition, John supplements the material with his own “clinical gems” collected from his many years of experience. This course is a must for any professional using herbal medicine in their practice. "John Redden's session alone was worth the fee for the whole weekend." Please visit Richter's website for more details. 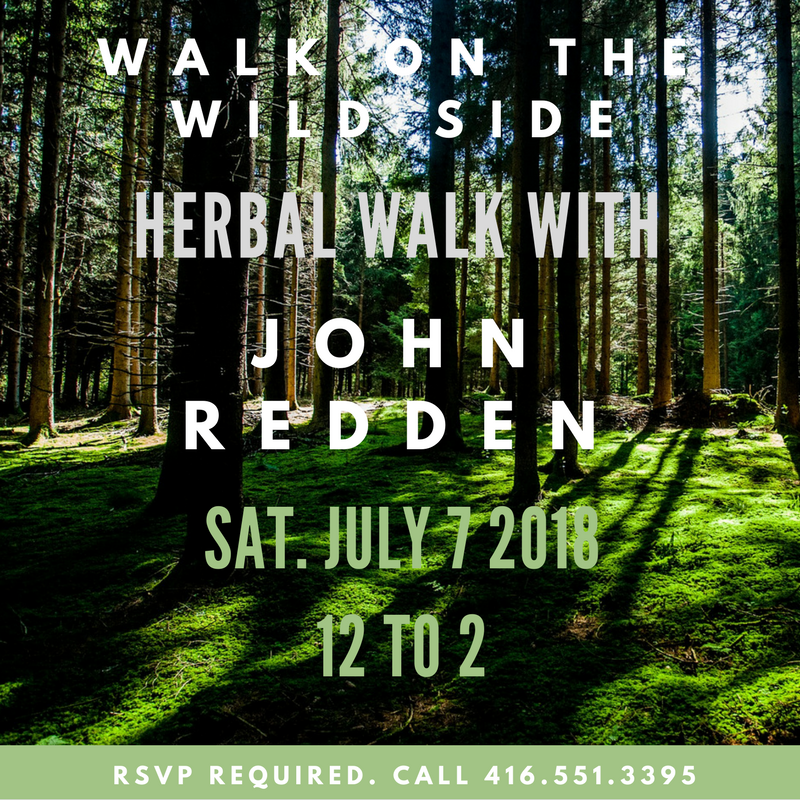 Join John Redden RH on a Herb Walk in Old Mill, Toronto. Please make sure to wear appropriate clothing and comfortable shoes/hiking boots, and bring water with you. This Herb Walk is organized by the O.A.N.D. (Ontario Association of Naturopathic Doctors). Please visit their site or call them for more information on how to register for this event. 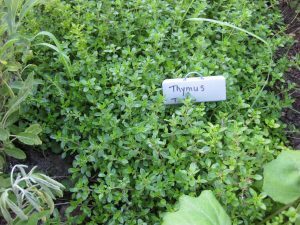 This Herb Walk is not to be missed! It will be a long hike, so please make sure to wear appropriate clothing and comfortable shoes/hiking boots, bring water and a lunch. Please visit their site or contact them for more information on how to register for this event. Please wear appropriate clothing and comfortable shoes/hiking boots, and bring water. This Herb Walk is organized by Odessa Gill, BSc, ND, of Aspire Health. RSVP is required, please call (416) 551-3395 to register for the event. You can visit their site for more information. Heat/Excitation: Mastering One Energetic Category at a Time. John Redden RH speaks about how a diagnosis of cancer need not cause panic or despair. Cancer is a treatable metabolic disease. John will discuss herbs, mushrooms and foods as therapeutic adjuncts or even as the main treatment for cancer. Whether you use orthodox or natural medicine, or both, herbs can help in very meaningful ways. This is a part of Richter's Herbs Free Events Lecture Series. John Redden RH will be speaking alongside herbalists Matthew Wood & Christine Dennis RH at this annual retreat weekend. This event is happening at Otter River’s farm, Port Burwell, ON. John Redden RH will be presenting on Herbal Applications for Mental Wellness; Understanding The Indications & Energetics at this Clinical Tools for Mind-Body Medicine conference. functionality to assist in resolution of causative factors. Verna Hunt ND will be teaching the first seminar in a new BWC Seminar series. This first seminar will be on ‘The Belly’ and will be held at Viriditas Herbal Products, Ltd. Space is limited to 15 participants (who must be licensed practitioners – ND, DC, RMT), so register ASAP. Join John Redden RH at several OAND Herb walks for Naturopathic Doctors, Herbalists & Herb Enthusiasts. John will be doing an in depth study on HOW TO COMPOUND herbal formulas specific to a patients needs. Formulas will be developed from Intake to Prescription so that practitioners may feel confident in tailoring custom formulas to suit & treat their patients concerns. 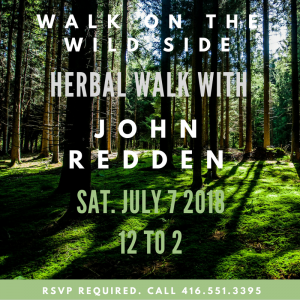 Join John Redden RH at this herbal focused weekend in Claremont, ON. 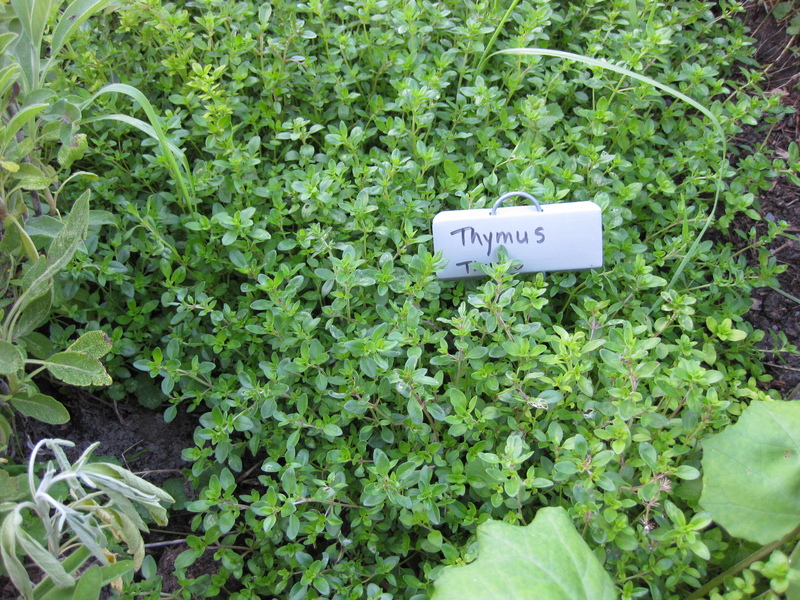 John will lead a herb walk and discuss Herbal Medicine in the Age of Antibiotic Resistance. Join John Redden RH & Angeli Chitale ND at the annual OAND Herb walk for Naturopathic Doctors at Matchedash, Coldwater, ON. John Redden RH will be speaking on How to Boost Your Immune System with Herbs. John Redden RH on Labour Preparation Support & Recovery with Botanicals. The event will be held at the University of Toronto, 121 St. Joseph St. Toronto, Ontario. This event will take place in Claremont, Ontario. We will perform a series of exercises to open inner cognition. Direct knowledge is the Way of the Heart. In this session we will experience meditations, attunements and resonance as taught at Findhorn (Scotland) by the original founders and a few other monastic settings. The understandings that come cannot be found in books. It is initiatory and therefore transformative. You will learn how to learn. John Redden RH on specific herbs for specific pains. The event will be held at the University of Toronto, 121 St. Joseph St. Toronto, Ontario. Beginning on May 28th, 2015 the class will meet one Thursday a week from 6:30PM to 8:30PM for 5 weeks. The fall session begins on September 3rd, 2015 where class will meet every Thursday from 6:30PM to 9:00PM for 11 weeks. To discuss the medicinal uses of these plants & about 25 more local wild herbs. To learn bydoing, how to prepare and use the various remedies they provide; to address concerns about the appropriateness of herbal medicine for our time and the importance of ecological sustainability. A Certificate of Completion will be awarded at the end of classes. 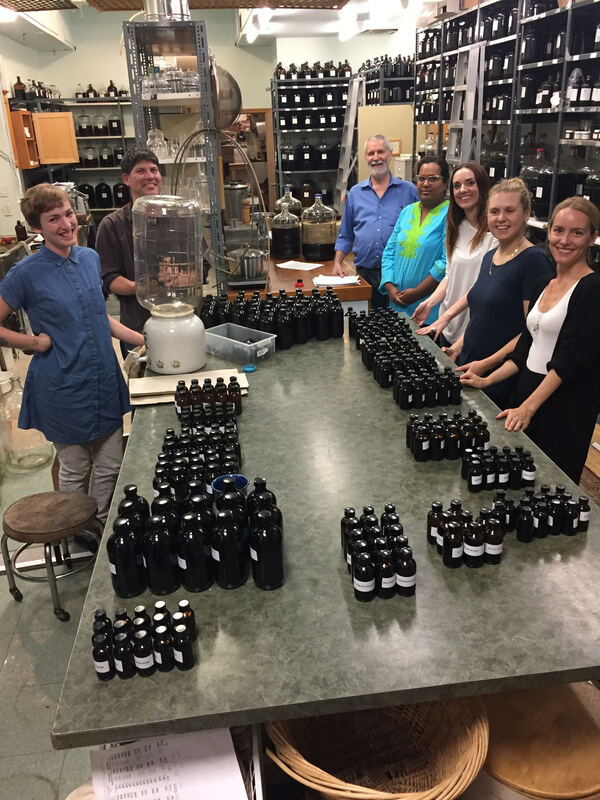 Students will keep an assortment of tinctures, salves, syrups, creams and fermented foods that they have manufactured during class time. Continuing Education Credits may be applicable for professionals. 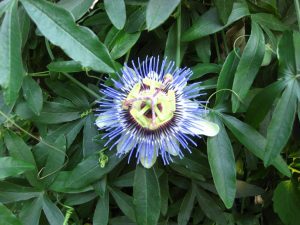 An herbal history from Hippocrates to present day, including Hildegard von Bingen. From Ancient Egypt to Greece and through Arabic to Medieval medicine, on to present day, John Redden RH will discuss the history of holistic herbal medicine. We will list and describe the items you need to make a herbal first aid kit. General home health care information for families at home, the cottage or camping. Poultices, plasters, baths, soaks, salves, lotions, etc… for home or practitioners. Cancer as a metabolic disease is the centre of our focus of treatments. The work of Warburg, Seyfried & D’Agostino will be introduced in our discussion. Ketogenic diets, juicing, supplementation, blood sugar regulation, detoxification, immune support & psycho-spiritual components will all be discussed and configured into an integrative system of patient care. A holistic model of health & treatments will be elucidated. We will cover all the body systems and approximately 100 herbs by actions, pharmacology,and energetics. Basic concepts and principles of the natural sciences will be introduced and applied. Botany, pharmacognosy, phytochemistry, pharmacology, herb-drug interactions, and human physiology will be presented with the principles addressed and integrated into the course at the appropriate times. A holistic model of health & treatments will be elucidated. We will cover all the body systems and approximately 100 herbs by actions, pharmacology,and energetics. A herbal material medica will be developed and cross referenced by physiological action categories, body systems and tissues affinities, phamacognostic plant metabolites, energetics, and historical uses. There is a 15 student minimum required to create a second class on a different evening. Email us, so we can send you an invitation to ZOOM for audio/video presentation of the live class sessions. Note: If you have registered and missed a class, because this course is taught in modular, you can retake the missed class (s) next year or come by Viriditas and listen to them (sorry, they will not be available online). Attendance is logged, and at the end, the hours you attended will be recorded on the certificate for your CE application.